For those of us who live on the Mainland, the words “king,” “palatial residence,” and “Hawaii” are likely to conjure up images of Elvis, Graceland, and the movie Blue Hawaii, before recalling that Hawaii once had a royal family. 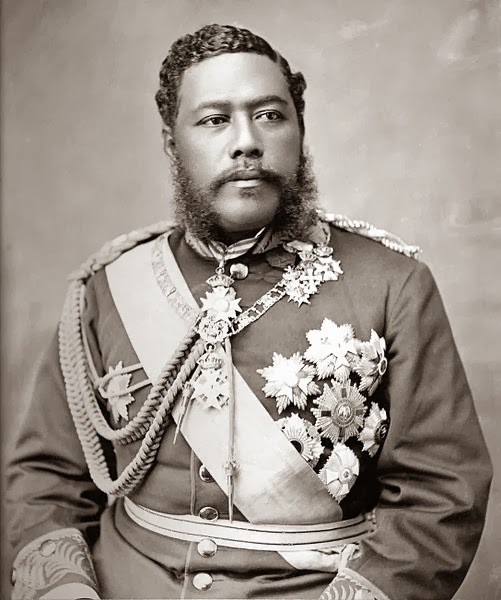 One of the kingdom’s last monarchs was David Kalākaua who ascended the throne in 1874. Kalākaua entered the history books again that year when he became the first foreign head of state to visit the United States. While the purpose of his trip was to sign a treaty of reciprocity, assuring Hawaii a duty-free market for its sugar and other goods, he used the opportunity to visit people and places in America that had had a long relationship with his country. Two menus dating from this period, one from a dinner with old contacts in the whaling industry, the other from a luncheon after he returned to Hawaii, reveal interesting details of his goodwill visit and daily life at home.